Step #1 - Benefits Verification: Call Benefits Verification at (256) 429-4878 as soon as possible to ensure your procedure is covered by your insurance. Please give us current contact information for yourself and your emergency contact. It is important that we have up-to-date information on file. Step #2 - Pre-Anesthesia Clinic (PAC): You may need preoperative testing. If the surgeon’s office has instructed you to come to the hospital for testing, do so as instructed. Some patients may not need preoperative testing, but everyone is required to have a medical history performed by an RN at Crestwood Medical Center. We can take care of this by phone. However, there is no need to call us. We will contact you before your surgery. Step #3 - Get Organized: Be certain to have a current list of medications you are taking, along with dosage and how often you take them. You will be asked for this information either when you come in for preoperative testing or when we call you for your medical history. Pre-Anesthesia Clinic (PAC): Hours of Operation are Monday - Friday 8 a.m. - 5:30 p.m.
Joint Replacement Surgery: You will receive information by mail regarding your Joint Class and Pre-Anesthesia Clinic appointments. Joint Class is scheduled on Mondays and Wednesdays. Spine Surgery: If you are diabetic or have high blood pressure, please visit our Pre-Anesthesia Clinic (PAC) 7-10 days prior to your surgery. Tuesdays and Thursdays are the preferred days for spine surgery patients to complete PAC but if those days are not convenient please come when you can (PAC hours listed above). All Other Surgery: If your surgeon instructs you to complete Pre-Anesthesia Clinic prior to surgery, please do so at your convenience (PAC hours listed above). However, we recommend avoiding Mondays and Wednesdays if at all possible as these are our highest volume days and your wait may be longer. Transportation: You must have a responsible person to drive you to the hospital and home after your surgery. Bathing: Preventing postoperative surgical site infections is a joint effort between you and your health care providers. You will receive a bottle of Hibiclens and instructions for bathing the night before and day of surgery. If you are not required to complete Pre-Anesthesia Clinic, then bathe with an antimicrobial soap the night before and day of surgery. It is very important that you bathe using one of these methods. This helps to prevent infection. Do Not Dress Up for Us: Do not wear make-up, nail polish, or jewelry. Do not use any hair products (hairsprays, gels, etc.). Wear loose, casual clothing. A jogging suit with an elastic waistband is ideal. Do Not Eat or Drink: It is very important to remember not to eat or drink after midnight the day of your surgery or at the time given to you by your surgeon (including gum, mints, and water). Do Not Smoke the Day of Your Surgery: Smoking causes lung irritation and could cause breathing problems during and after anesthesia. CPAP Machine: If you sleep with a CPAP, please bring it on the day of surgery. Leave Your Contacts at Home: If you wear corrective lenses, do not wear contacts. Bring along your extra glasses. Be Sure to Let Us Know If You Are Pregnant: If you are pregnant, or even think you might be, notify your surgeon and anesthesiologist immediately. Valuables: Leave your jewelry, money, and other valuables at home. Medications: Take any regular medication as you normally would, with only a sip of water unless directed by your physician. Bring a list of your regular medications, your dose and how often you take them. If you feel sick: In between scheduling your surgery and the day of your surgery, if you develop a cough, cold symptoms, or fever, be sure to notify your surgeon. If You Have a Beard: You may be asked to shave your beard on the day of the surgery. Visitors in Pre-Op: You will be allowed 2 visitors in the pre-op area on the day of your surgery. Please keep this in mind as you are inviting friends and family to the hospital. Parking Area: The Outpatient Center Entrance (see map below) offers a secure and convenient parking area with easy hospital access. Valet Parking is available for your convenience at this entrance Monday - Friday. Surgery Waiting Area: Our large waiting area is located on the first floor just inside the Outpatient Center Entrance. The waiting area is staffed Monday through Friday, 6 a.m. - 6 p.m. Visitors should register at the desk so the receptionist can contact them quickly if a physician or hospital employee calls with information. Arrival time on the day of surgery is determined by your surgeon. 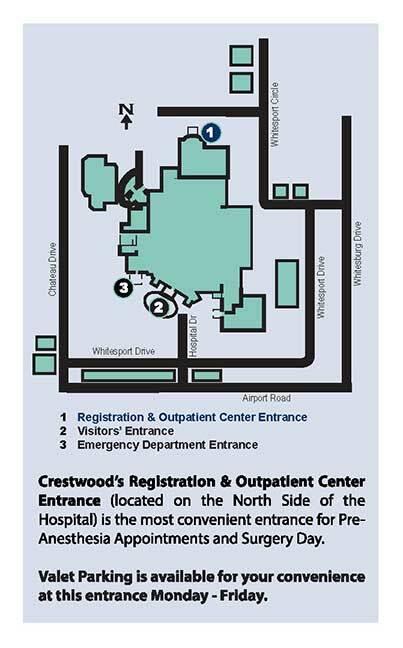 Enter Crestwood Medical Center through the Outpatient Center Entrance located on the North side of the facility. You will go to Registration and finalize insurance paperwork and be given an ID bracelet. If you are running late, let us know as soon as possible at (256) 429-4950. With your input, the surgeon will mark the surgical site. Once your prep is completed, you may have 2 visitors join you until time for surgery. Often patients are given medication to help them relax prior to going into surgery. As a result, you may not remember anything about your arrival into the operating room. During your surgery, you will be cared for by a team of dedicated and skilled professionals that will include your surgeon, an anesthesiologist, nurse anesthetist, registered nurse, and surgical technicians. While you are in the recovery room, you will receive constant care from a post-anesthesia care nurse. Your nurse will monitor your vital signs, pain and nausea levels, and surgery site. Patients are not allowed to eat or drink in the recovery room. Visitors are not allowed in the recovery room unless the patient is a young child. Your nurse’s goal is to give you enough pain medicine to make your pain level manageable; however, the pain medicine usually will not take away all of your pain. If you have a surgery that requires a foley catheter, it is common to wake up from surgery with the sensation of needing to urinate. However, your foley catheter will already be draining your urine. Crestwood Medical Center participates with most insurance carriers. We will work with your surgeon’s office to ensure proper authorization from your insurance provider is obtained prior to your procedure. Medical expenses not covered by your policy will remain the responsibility of the patient and are typically due at time of service, but we will take care of submitting claims for hospital charges to obtain payment. Please note that charges for professional services, such as from your surgeon, anesthesiologist, radiologist, and pathologist will be billed separately by the individual physician. We are happy to assist you, and thank you for choosing Crestwood. For billing questions after surgery, please call (256) 429-4820.